"Various studies have shown that properly written website texts/translations make up more than 20% of the total amount of conversions"
Poor translations can destroy your conversions. This is a real shame, because you’re probably doing a lot of things right! Many translation platforms and cheap translation agencies simply don’t provide the level of quality you need. Fairlingo offers high-quality certified online translations at competitive rates. 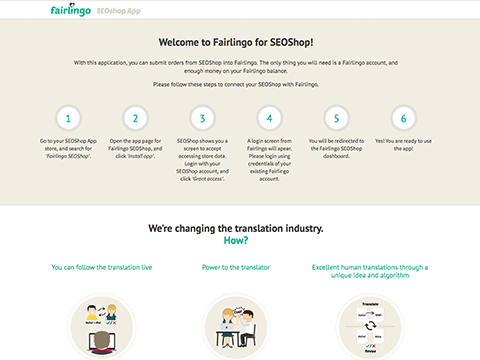 Fairlingo is the only ISO-certified translation platform in the world, and specializes in e-commerce translations. 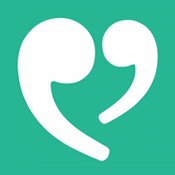 With our cloud technology and the unique collaboration between translators and our algorithm, the quality offered by certified agencies is available to you via this app. Fairlingo was developed by Vertaalbureau Perfect, one of the leading translation agencies in the Netherlands. 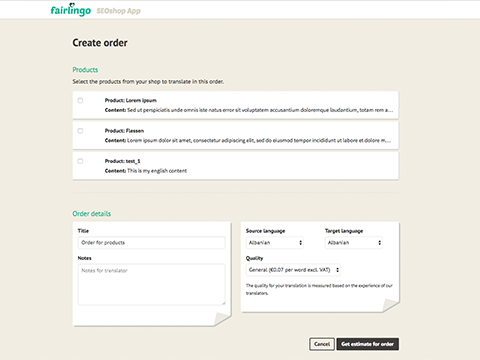 Many years of experience in translating online stores have gone into Fairlingo and this app. The translation community consists of over 3,000 translators, each with their own area of expertise, who always translate texts into their native language. We’ve contributed to the international success of many different online entrepreneurs. After you download our free app, select the desired content and you will immediately receive an overview of the costs. If you are happy with the price, you can order the translation right away. 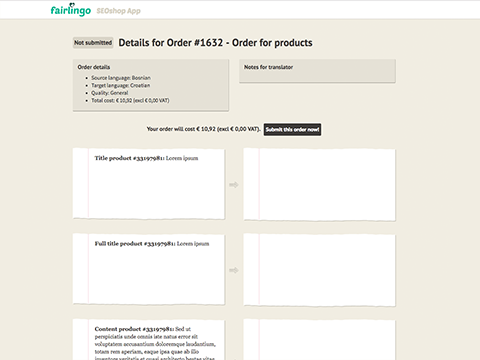 As soon as your content has been translated, the translation will be uploaded to the online store. You can follow the translation process live, and you can contact the translator during this process if necessary. If you need support, call +31 53 203 0046 or send an email to [email protected].